Early in his career, the Fire/EMS Department recognized Jesse McCullough as someone special. In May 2013, at the CRS #47 graduation, he was chosen out of 19 other graduates to receive the “Fire Chief’s Award”. This award, the highest given in recruit school, is bestowed on an individual who best exemplifies conduct required of the Department. Selection criteria emphasizes leadership, professional development, integrity, performance, and personal growth. 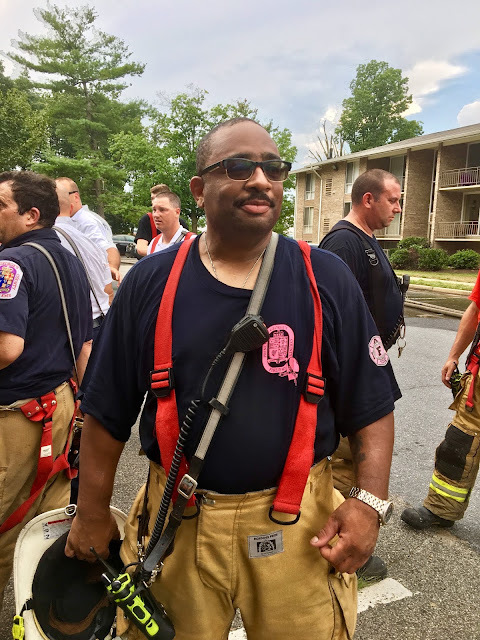 Firefighter McCullough, assigned to Landover Hills Fire/EMS Station 830 on B shift, is an excellent employee who consistently strives to do his very best. For example, one chilly December day in 2017, he and fellow crew members were tasked with rescuing a dog stranded in a frozen ravine. It is preferable that animals and pets are rescued by firefighters instead of well-intentioned Good Samaritans, who in their efforts could potentially sustain injuries or worse. Following the crew’s rescue of a golden retriever,McCullough, representing the Department, explained their act of humanitarianism to members of the media. In January 2017, Jesse began a battle for his life after receiving a diagnosis of Stage IV Metastatic Colon Cancer. However, he is not alone in this fight, as his family and extended Fire/EMS Department family are facing it head on with him. Some of this will be redundant with my Fire Department family. The rest of the folks on here don't know what is going on with me, but they are seeing benefits in my honor and have questions about it. I have been diagnosed with stage IV colorectal cancer that has spread and grown. The prognosis given is that I have a few months to live unless a successful treatment is found. I do not believe that my fight is over. Prior to this point, I have done a bunch of chemo and surgery. Some people know but most do not realize that the career I love also brings with it a significant increased risk of cancer. The type I have been diagnosed with is one associated with the hazards of firefighting. I am incredibly blessed to have wonderful family and my fire department family taking care of me. This is obviously a hard time for us, especially since the cancer spread extremely fast. I have been fighting this battle for over a year and have been healthy and active, for the most part—needing only a few days off around my shift for treatments and a couple months off for a colon and liver resection. My brothers and sisters in the Department covered my shifts during that time, for which I am eternally grateful. I expect that a lot of people will have questions, as well as suggestions, regarding treatment. Just know we are exploring more options than one might imagine. I also expect that people likely will want to help, and there are a couple of ways to do this. One way, which may or not be hard for some, is to write down a memory or funny story or anything you can think of and send it to me in messenger or email. Susie had a wonderful idea that we could do this, and down the road when I am gone she will be able to share those stories about me with our girls. This would mean a lot to us. Sorry to drop such heavy news on everyone; but, unfortunately, it does seem as though time is running out. I hope my words find everyone well, and I wish no else would have to go through this. I know that's unrealistic, so take the time today and really appreciate what you have and your loved ones—even if just for a moment. 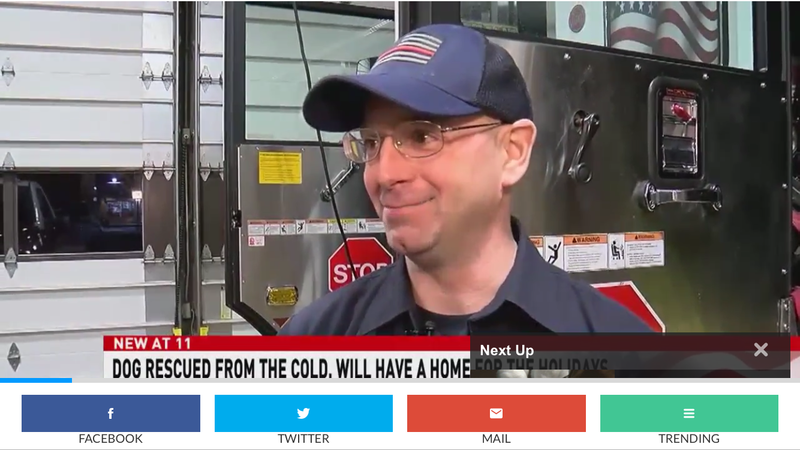 “Jesse is the type of firefighter you want on your shift as part of your crew standing next to you as you go about your job. He is the firefighter that you want as an employee and representative of both your Department and Prince George’s County. He is the type of person you want as a husband and father.” - Fire Chief Benjamin Barksdale. 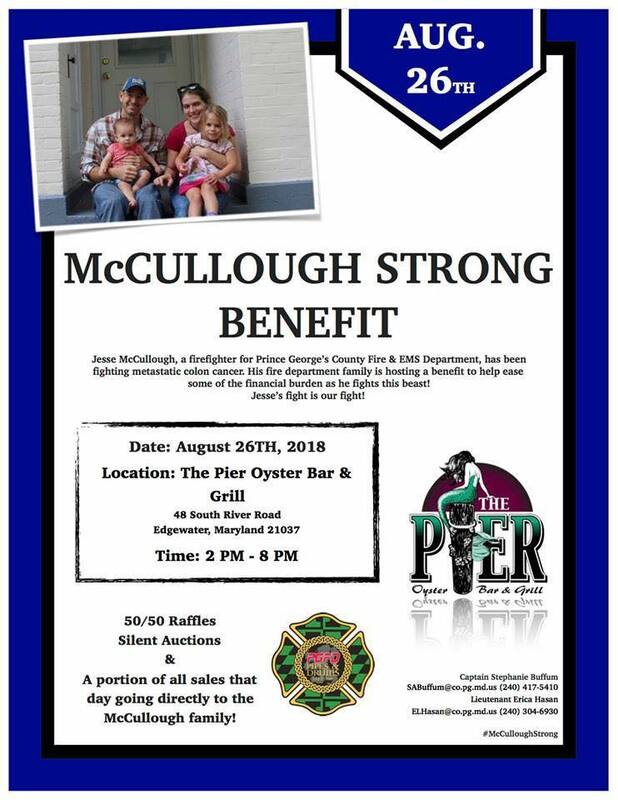 The PGFD firefighting family is raising funds to assist this young man and family as they fight to save his life. 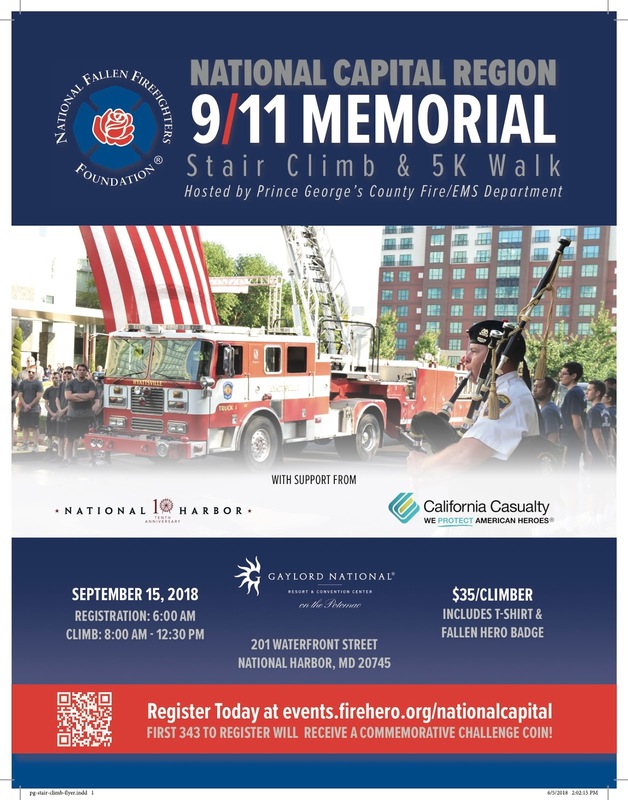 There is a Go Fund Me account and other fundraising events that everyone is encouraged to attend. 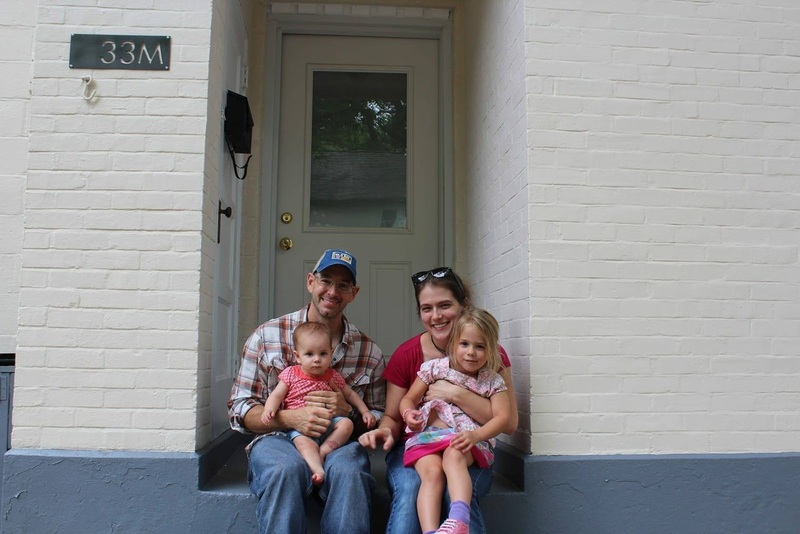 "Jesse McCullough is a beloved father to two beautiful little girls, husband to Susie, and dedicated friend to many," said Fire Captain Stephanie Buffum. "Jesse is awaiting acceptance into a Clinical Trial and is hoping to start momentarily. In the interim, he will continue chemotherapy. His fight is far from over; Jesse’s fight is our fight!" 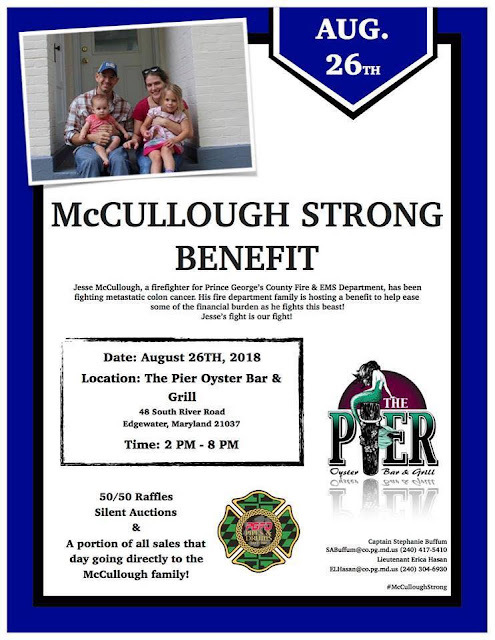 Jesse’s firefighting family want to ease the McCullough’s financial burden while they conquer this beast. Some of the costs associated with clinical trials include travel expenses and medical bills not covered by insurance. Both Jesse and Susie are employed; however, his treatment schedule and other pertinent factors will significantly impact the couple’s finances. "Please find it in your heart to support the McCullough family," asks Buffum. A fund raising event will be held this Sunday, August 26th. Everyone is invited to attend. The Prince George’s County Fire/EMS Department and Office of the sheriff gratefully acknowledge the College Park Moose Lodge #453 for their recognition of our personnel. 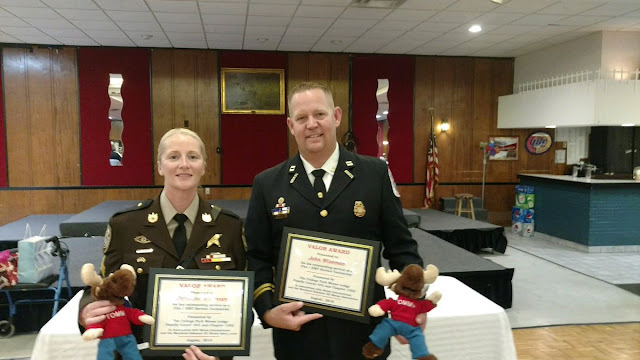 The Moose Lodge presented Valor Awards for their actions at the scene of an incident in October 2017. It was a busy lunch at Babes and Boys Tavern, also known as Top of the Hill, in Upper Marlboro, on October 24th. It was a typical lunchtime crowd with numerous Prince George’s County employees with many being from public safety. Just after 1:00 pm a vehicle left the roadway and struck the side brick wall of the building. The vehicle drove through the wall into the dining room narrowly missing Deputy Sheriff Sergeant Christine Wiseman by mere inches. There was catastrophic destruction to the building’s interior with several occupants injured. The video shows the destruction and aftermath. 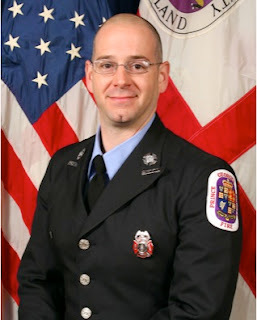 Seated at the counter enjoying lunch was retired Prince George’s County Fire/EMS Lt. Colonel John Proels. He sustained severe lacerations about his head as well as contusion injuries. Once he gathered himself and cleared off the dust he went to doing what he was trained to do, start helping others. Despite being seriously injured he started to move debris to access a critically injured patient that eventually succumbed to his injuries. Christine Wiseman immediately went to help the injured and evacuate the walking wounded. She was soon joined by her husband who had arrived to enjoy lunch. Fire Fighter/Medic Captain John L. Wiseman arrived as the dust from the crash was still settling. Fire Captain Wiseman began to assess the victims and cleared a path for the firefighters and medics quick access to the most critically injured. Additionally, Wiseman was able to relay critical information to responding incident commanders and fire/EMS department personnel, as they arrived. Off-duty Fire Fighter S. Zamary also arrived on the scene moments after the crash occurred and before any Fire/EMS department arrived and without hesitation went to work assisting with patient care, evacuation and scene safety. These public safety personnel were presented with Valor Awards from their respective agencies for their heroic actions in April 2018. Proels and Zamary were out of town and unable to attend the ceremony. Yvorra Leadership Development Foundation, Inc. Since 1989, YLD has awarded $163,000 to 99 award recipients. To request an application go to http://www.yld.org and click “Applications”. The deadline for applications is October 30, 2018 and awards are usually announced in late December. A 3- Alarm fire significantly damaged an Upper Marlboro building this morning. 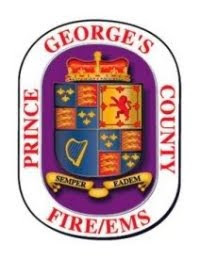 At around 1:30 am, Thursday, August 2, 2018, Prince George’s County Firefighters were alerted to a building fire at 14703 Main Street in the Town of Upper Marlboro. Firefighters arrived within 3 minutes of dispatch to find fire coming from a restaurant at that address. Three alarms, approximately 100 personnel, were summoned to the scene to extinguish the fire which occurred around 3:00 am. Fortunately, no firefighter or civilian injuries were reported. Three occupants from apartments on the top floor of this 3-story building were displaced and assisted by the American Red Cross. 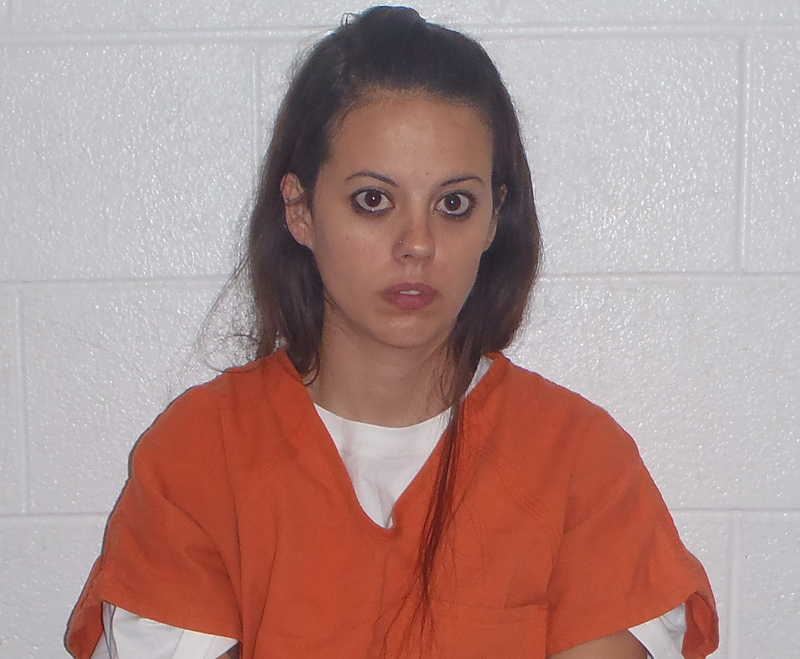 Jessica Marie Poole, 26 years-of-age, of Harwood, MD arrested today for Arson in connection to a 3-alarm fire this morning in Upper Marlboro.